Valentine’s Day is on a Thursday this year. So you can go out for a nice dinner or have a cozy night in, but there’s not much else you can do in the middle of the week. However, delay your actual celebrations for a couple of days, and you can have a whole Valentine’s weekend. Here are 7 weekend getaways from Delhi to make your Valentine’s Day celebrations extra special this year. Jaipur is the land of forts. 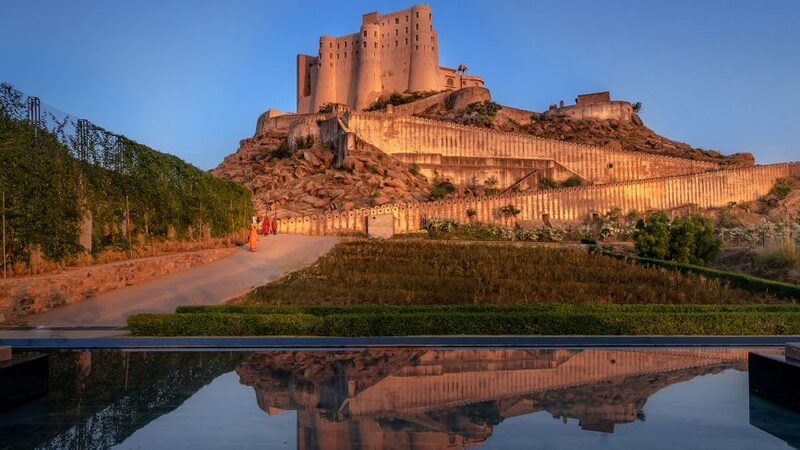 From Nahargarh to Amer and more, you can find Rajasthan’s rich history etched on the walls of these iconic forts. But all this fort-hopping can be tiring. Book a weekend stay at Clarks Amer and immerse yourself in true luxury. One of the finest hotels in Jaipur, Clarks Amer has a special offer for Valentine’s Day at its beautiful in-house restaurant. Even if you can’t make it for V-Day, this hotel is one of the best weekend getaways from Delhi. And it’s only 5 hours away by road. There are several resorts in Rajasthan where you can experience mind-boggling luxury mixed with a rich heritage. Each resort and hotel here has its own specialty. But one of them truly stands out. Formerly a warrior fort, Alila Fort, Bishangarh is only 4 hours away from Delhi. The architecture of this hotel is a quaint mixture of Mughal and British styles. The fort is 230 years old but you wouldn’t know it if you saw the interiors. Modern, plush, oozing with luxury with touches of the rich history of this hotel. If it’s the ultimate in luxury you’re after, this is where you need to spend Valentine’s weekend. In Pali, you can get your own cottage with a beautiful view and a private pool. Lounge there for hours as you watch the sun rise or set. Enjoy each other’s company in the most beautiful backdrop you could imagine for the most romantic time of the year. 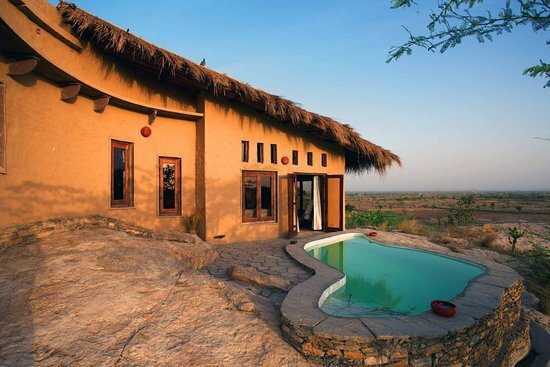 Lakshman Sagar resort, which has cottages with private pools, is about 8 hours away from Delhi. Leave early in the morning and reach comfortably by lunchtime. The weather around Valentine’s Day is quite perfect for a day-long drive with your loved one, so make the most of it. The weekend of February 16-17 will be the last weekend for the iconic Rann Utsav. So you can be sure that it’s a special time to be in the Rann of Kutch. The vast, white expanse before you and the clear, starry skies above make for a fantastic experience. Book a luxury tent at the Tent City and enjoy the wonders of the Rann. You can catch a flight from Delhi to Ahmedabad. From Ahmedabad, the Rann of Kutch is about 6 hours away by road. 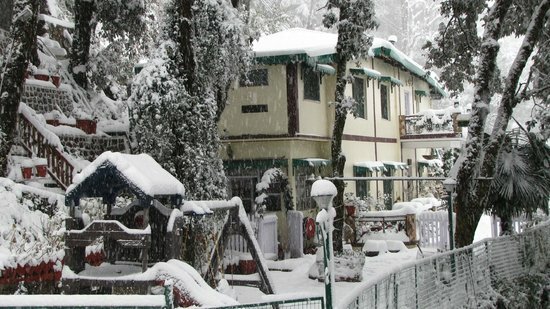 While you may not get snow in February in Mussoorie, you will definitely feel the cold. And that’s the perfect excuse to get cozy by a fireplace. If your aim is to spend quality time with each other, there is nothing better than snuggling up with cups of hot chocolate (or wine) and cutting off from the rest of the world for a couple of days. Choose one of the heritage properties in Mussoorie for a truly special Valentine’s Day. Mussoorie is only 6-7 hours away from Delhi by road. You can also fly to Dehradun and take a cab from the airport to make the journey shorter. 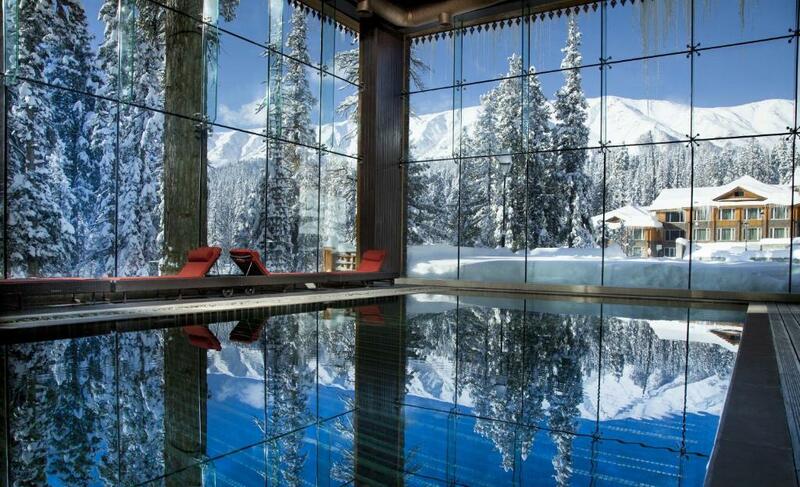 If you want a snowy Valentine’s Day, Kashmir is your best bet. Head to Gulmarg to see one of the most romantic destinations in India. This winter wonderland is perfect for those who like a bit of adventure, especially winter sports. You can go skiing, get a cable car ride in the snowy mountains, and drive to your hotel on ATVs. If nothing else, just step outside and play in the snow. There are daily flights to Srinagar from Delhi, and from the Srinagar airport, Gulmarg is only one hour away by road. You can get cabs easily from the airport taxi stand in Srinagar. A warm fireplace and a hot cup of cocoa are just what you need to complement a holiday in Corbett National Park. Only 5 hours away from Delhi, this area has several resorts and hotels but a few stand out for their location and unmatched ambience. One such place is Aahana, a luxury resort in Corbett. This resort has luxurious, Victorian villas with private balconies and a view of the glorious forest. This is also the perfect place for a couple’s spa where you can relax and rejuvenate yourselves, together. Set out for a jungle safari during the day or night to feel the mystery and adventure of the jungle. You can drive here from Delhi or get a cab. Book your romantic getaway and have an extra special Valentine’s weekend.